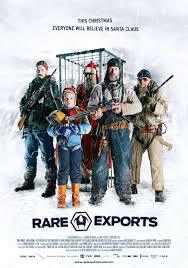 RARE EXPORTS : A CHRISTMAS TALE **** Finland 2010 84 mins Dir : Jalmari Helander. A dark-hued fantasy, with shades of Tim Burton and a tone that cannily straddles humour, horror and fantasy, this beautifully shot picture is built upon the theory that the real Santa Claus tore kids to pieces and got trapped and buried in ice, later to be replaced by the phoney, sentimental Coca Cola Santa. The uncovering of an ancient tomb apparently containing the real Santa forms the basis of a wonderfully evocative and ominous prologue. Although it seems to end at the point where it really looks like it’s getting going, this offers a lovely evocation of childhood fears and a poignant portrayal of youthful friendship, enhancing the very appealing, good natured 80’s horror feel. The Danny Elfman-inspired score is rich and exciting.